Client participants with assistance from coaches (see description, below) create a "recovery plan," a detailed statement of personal recovery goals and corresponding action items. Recovery goals may be broad ranging across domains such as employment, education and training, physical and behavioral health, housing, social interaction, and hobbies. Client participants with assistance from coaches (description below) create a personalized plan for spending on both traditional and non-traditional products and services, where traditional services are usually defined as those services covered by Medicaid. The total budget available to each individual is determined by the SDC program's administrators, and sometimes varies across individual participants depending on their expected needs or other factors. Budget amounts are specified in the spending plan for each of the services and products included in a consumer's "recovery plan," a detailed statement of recovery goals and corresponding action items. In most programs, program managers or supervisors (description below) are responsible for approving these spending plans. Coaches assist SDC participants in developing their "recovery plan," support the budgeting process, may offer advice on spending priorities, and serve as a mentor and resource. Coaches are variously termed recovery coach, life coach, support broker, support specialist, and peer-specialist. Coaches receive training in self-directed planning and recovery oriented care. Some programs hire "peers" (i.e., persons who themselves are in recovery and who embody the hope for recovery) into paid positions as SDC coaches, whereas other programs hire professional case managers who have received training in the SDC approach. The program manager or supervisor is responsible for employing and supervising coaches, pairing SDC participants with coaches, ensuring that coaches receive appropriate training, ensuring regulatory compliance (e.g., with state mental health and Medicaid regulations), approving budgets and individual participants spending plans, and other executive functions of SDC program administration. In some programs, the program manager is responsible for approving participants' purchases of non-traditional products and services, in accordance with the SDC program's purchasing policies. A fiscal (or financial) intermediary in SDC is an agent that processes payments to service providers and helps manage accounting and other fiscal responsibilities, such as handling, managing, and accounting for funds in individual budgets, preparing payroll taxes (for personal assistance services employees) and maintaining required tax records.13 A SDC program may also contract with a fiscal intermediary to handle other tasks, such as providing standardized reports to the SDC program and its participants regarding participants' services utilization and expenditures. A fiscal intermediary could also be responsible for helping ensure that participants do not exceed their budgets, for example, by providing information. The fiscal intermediary also has an obligation to ensure that all required agreements between participants and providers are in place before making payment and may perform support functions such as checking provider qualifications and conducting reference and background checks. The fiscal intermediary does not contract directly for any services and does not serve as an employer of service providers. In mental health SDC programs, various arrangements have been made for fiscal intermediary services. In some programs, a not-for-profit community service organization has served as fiscal intermediary under a contract to the state mental health authority. In other programs, a local core serve agency, a branch of the state mental health authority, fulfills this role. In other programs, some of the functions of the fiscal intermediary are contracted out to a managed behavioral health care organization while the program administrator fulfills others. Many non-mental healthSDC programs contract with a "fiscal management entity," an independent organization that specializes in providing fiscal intermediary services to SDC programs, though this arrangement has rarely been used in mental health SDC. Most SDC programs establish a provider network and do not reimburse expenses for encounters with other (non-network) providers. However, most programs accept into the network any willing provider who agrees to the SDC program's rules and accepts the SDC approach. Often a program will also negotiate with the provider a specified level of reimbursement for encounters with SDC participants. Some SDC programs also have a vetting process that includes verification of the provider's credentials and standing in the community. Mental health SDC participants typically have not directly hired employees, such as personal care attendants frequently hired by persons with primary physical disabilities. By contrast, the employer authority (i.e., the option offered to program participants to serve as the legal employer of a service provider) is a critical feature of Cash and Counseling and other consumer-directed programs for persons with physical disabilities. For persons with physical disabilities, in-home support services and transportation services are essential in order to be able to live independently in the community. The authority to hire and fire personal assistance services providers gives participants the flexibility to select those service providers that are most likely to meet their requirements. However, in most mental health SDC programs, providers have maintained their own employment, and have been paid on a fee-for-service basis. How the employer authority might work in mental health SDC programs should be considered, as this authority would seem to be an important component of a recovery oriented approach, at least for some SDC participants. Worksheets, websites, and educational materials are offered to support planning and independence from formal services. Coaches maintain a working knowledge of these resources and help direct participants to relevant ones. The participant, with the support of the life coach as necessary, monitors the recovery plan and its implementation, the spending plan, and the budget on an ongoing basis. Participants may change services, providers and supports as needed within the constraints of their individual budgets. Current and former SDC participants also often have key roles in the management, oversight, and administration of SDC programs. Their participation serves, in part, to ensure that the program continues to adhere to the principles of autonomy and self-direction. Consumers also may advocate for continued program funding, nominate providers to the network, and design training materials for coaches. In some SDC programs, consumers also have input into the development of purchasing policies and procedures. SDC programs offer participants much greater flexibility in choosing products, services, and providers than is available in conventional mental health services. Budgets can be used to purchase specialty mental health care as well as many other products and services that are not offered by specialty mental health care providers. Examples of non-traditional products and services that participants in existing SDC programs may purchase using SDC budgets include smoking cessation programs, tuition and other education-related expenses, general medical care, and dental care. The total amount of money individuals can spend in SDC is typically capped at values ranging from $1500 to $4000 per participant per year, depending on the program.33 Some programs "cash out" outpatient mental health clinic services, which means that participants' individual budgets include the money that would have been allocated for these services, whereas other programs do not give participants control over this spending. Participants may use the money in their individual budgets to purchase specialty mental health care services (e.g., outpatient individual or group therapy) and may also purchase non-traditional services and products and other costs not covered by their insurance plans, for those who have insurance. Most programs do not stipulate the proportion of the individual budget that participants must spend on specialty mental health care versus other products/services, though some do, particularly for persons who are uninsured. Some SDC programs use suggested formulas such as asking participants to spend a certain proportion of their budget on traditional mental health services, usually defined as those services covered by Medicaid. Individuals enrolled in Medicaid can utilize Medicaid-covered services with minimal out-of-pocket expense. However, Medicaid benefits in some states may not include some traditional mental health services, such as supported employment or family psycho-education, or Medicaid coverage may not fully cover the costs of care for available providers of these services. In those cases, SDC participants may decide to pay for uncovered mental health expenses using their individual SDC budgets. Uninsured persons are eligible for enrollment in some SDC programs (e.g., Florida SDC). For the uninsured, payments for mental health services are deducted from the individual's SDC budget. In some programs, uninsured participants are also required to spend at least a specified percentage of their SDC budget on clinical services. In a mental health SDC program in Delaware County, Pennsylvania individual budgets have been used to purchase a wide range of items, such as hearing and vision tests, health club memberships (for weight reduction) and nicotine patches. Figure 2 shows Freedom Funds expenditures during the first year of the program by category. The largest expenditure category was for physical health products and services (36 percent), followed by housing (20 percent), work/other activities (19 percent), education (19 percent), mental wellness (4 percent) and social activities (2 percent). SOURCE: Magellan Behavioral Health of Pennsylvania: Report to the Community, 2010. As pointed out by Alakeson,33 the broad categorization of spending shown in Figure 2 masks the variety of purchases made in mental health SDC programs. Physical health expenditures may be for items such as vitamins and nutritional supplements, health club memberships, vision services, hearing aids and batteries, weight loss program fees, exercise equipment, prescription drug expenses. Housing expenditures could include spending on rent, food, furniture, towels and linens, and moving expenses. Work-related expenditures could include spending on clothing, haircuts, computer software, fees for professional licensure, insurance, or car repair. Education-related expenses could include tuition, but might also include transportation, books, and computer supplies. Figure 3 shows mean expenditures per person in the Florida SDC for a sample of 80 program enrollees who participated in a survey conducted by Spaulding-Givens.20 The dollar amounts are from the Florida SDC program's administrative databases and correspond to a 12-month period for each respondent sometime during fiscal years 2009 to 2010. The spending categories are those used by the SDC program. Using SDC program records, Spaulding-Givens disaggregated expenditures in a "miscellaneous" spending category into sub-categories for computers/computer accessories, household items/appliances, hobbies, arts/crafts supplies, health/physical fitness, office supplies, and memberships/miscellaneous. SOURCE: Adapted with permission from Spaulding-Givens, J. 2001. Florida Self-Directed Care: An Exploratory Study of Participants' Characteristics, Goals, Service Utilization, and Outcomes. The Florida State University, College of Social Work: Tallahassee. Florida SDC participants spent $1509 per person during a 12-month period. This is only the amount paid out of participants' individual program budgets. It does not include health insurance reimbursements to mental health service providers and pharmacies for mental health care provided to participants. As shown in Figure 3, transportation had the largest mean expenditures of any category ($211 per person; 14.0 percent), followed by housing ($155 per person; 10.3 percent), utilities ($144 per person; 9.5 percent), dental services ($121 per person; 8.0 percent), and counseling ($117 per person; 7.7 percent). Medication spending ($99 per person; 6.5 percent) encompasses spending by persons who are uninsured, copayments, and any other medication expenses not covered by insurance. Wellness services ($70, 4.7 percent) include fitness club memberships and weight loss program fees as well as alternative medicine services, such as acupuncture. Although the mean values in Figure 3 may indicate a general spending pattern for the program as a whole, they do not necessarily correspond to any individual participant's spending pattern. In fact, participants' spending totals varied tremendously, from $0 to more than $3300. SDC programs generally do not include coverage for mental health visits to emergency departments or for mental health crisis, inpatient, or residential treatment services. These services also are not ones that participants self-direct or write into their recovery plans. Instead, these services are covered either by Medicaid, Medicare or private insurance, or by public mental health authorities or hospitals under uncompensated care. There are two main reasons why "acute care" services are excluded from SDC planning. First, individuals usually do not know what expenses they will have for these services before these services are needed, and any use of these services can result in high unanticipated health care expenses. Consequently, when planning a SDC budget, most individuals would not know what amount of money to allocate for use of these services, and they might not allocate enough to cover their expenses during the course of a year. Second, public mental health systems would not want to put individuals with SMI at risk for not obtaining mental health services during periods of crisis, when they are most in need of services and most at risk of harming themselves or others. Indeed, providing or paying for services needed by individuals with SMI during periods of acute exacerbation of mental health symptoms is a primary rationale for having a public mental health system. Psychiatric medications are not covered in most SDC programs, and psychiatric medication use is often not written into participants' SDC recovery plans. There may be no benefit to making psychiatric medications part of the SDC planning process, and there could be risks. As pointed out by one key informant, SDC participants have the option to "fire" their psychiatrist if they are unsatisfied with the medications they are being prescribed or with the medication decision-making process. Moreover, if psychiatric medications are included in SDC planning, medication expenses may affect participants' choices among medications and their use of medications over time. Such an influence could have adverse consequences for participants, including a greater risk of crises and hospitalizations. Although SDC participants are not allocated monies specifically for medications, many participants have prescription drug coverage through their health insurance plans. Also, participants usually are allowed to use part of their individual budgets to pay for medication expenses not covered by insurance. Mental health SDC represents both a philosophical and a practical departure from the conventional approach to planning mental health care. Key informants interviewed for this report were asked to offer their perspectives on how mental health SDC differs from traditional public mental health services (i.e., those mental health services that are typically covered by Medicaid programs and states and that are administered by a state mental health authority). This section provides a summary of their comments. "[SDC provides] the freedom to have a voice and to actively participate in navigating my own personal road to recovery. [Self direction] is the ability to choose the services that will be most effective for me in reaching that destination. Self direction is the freedom to request assistance instead of receiving it based on rigid criteria for treatment. It's a method of testing my potential and responsible limits by allowing me to take ownership of the choices I make...it's about choosing professionals in those fields that will best meet [my] individual needs." "People who have choice and control of decisions pertaining to their lives and services are more likely to be motivated. People who are motivated are more likely to be successful." Another key informant involved with the planning of one SDC program also emphasized the broader set of choices that SDC offers regarding providers and supports: "the whole philosophy of the [SDC] program is to take advantage of community supports not available within the traditional mental health system." These community resources may include access to additional mental health providers and programs, including private practices, and may include access to non-traditional services, such as fitness programs, transportation and education. Community resources also may include products, such as clothing for a job or household products needed to live independently. By contrast, in traditional services, the menu of reimbursable mental health programs and providers is more limited and clients are usually referred to the nearest mental health outpatient program that is accepting new clients rather than given the option to use other providers. As a result, spending in SDC can be shifted toward products, services, and providers that consumers value more highly within the constraints of a budget. 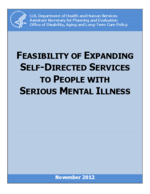 Some key informants to this report emphasized differences between the mental health SDC approach and traditional services that may impede implementation of SDC programs in Medicaid. A chief concern expressed by one key informant was how to ensure that standards for the quality of mental health care would be maintained. In public mental health systems, a minimum quality of care is ensured through provider licensing and training requirements, regulations that define the content of specific mental health services, systems' rollouts of evidence-supported practices, continuing medical education opportunities, independent performance standards, and other administrative policies. In contrast, SDC would allow consumers to select providers and services that may not be bounded by these policies. The implications of this point are discussed in Chapter 4. Other concerns were raised regarding the much greater scope of goods and services that SDC participants may purchase in comparison to consumers in traditional outpatient mental health programs. One key informant pointed out that one reason Medicaid sets limits on the goods and services that can be purchased is to ensure the integrity of the payment system. Services that are reimbursable are all generally considered standard components of mental health treatment. By contrast, SDC programs would allow some purchases whose legitimacy could be questioned on the basis that other Medicaid recipients and other privately insured consumers may not be reimbursed by their health care plans for similar purchases. This point is further discussed in Chapter 4. Another key informant with experience in managed behavioral health care contracting raised the concern that most SDC programs do not currently have an adequate administrative infrastructure for approving a large volume of proposed purchases. In most current mental health SDC programs, a program manager or supervisor approves participants' proposed purchases. However, the key informant indicated that if SDC programs are implemented on a much larger scale, the volume and variety of proposed purchases could overwhelm a program manager's ability to properly review each and every purchase. Consequently, in the key informant's opinion, many purchases would not be subjected to any significant review. Implications of this point for SDC program design are discussed in Chapter 4.